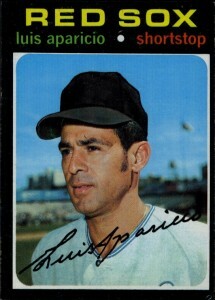 Like many stars that began their MLB career in the late 1950s, Luis Aparicio's earliest appearances on baseball cards are limited to just a few options. Thanks to the more modern releases, a decent variety has emerged. This following list examines the breadth of Aparicio's baseball card career and narrows it down to ten key cards. There are two schools of Hall of Fame-caliber shortstops; offensive juggernauts like Ernie Banks, Alex Rodriguez, and Cal Ripken Jr; and defensive prodigies like Ozzie Smith, Phil Rizzuto. Luis Aparicio falls into the latter group. After 18 seasons, Aparicio was the leader in nearly every defensive statistic from assists to double plays. He was so good at shortstop he never played another position during his entire career. 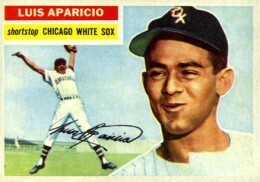 Aparicio was elected to the Hall of Fame in 1984 and his jersey number was retired by the White Sox the same year. Interestingly, when Omar Vizquel, another shortstop from Venezuela, joined the White Sox, he was allowed to wear the number (#11) after Aparicio agreed. Vizquel, who was also known for his longevity as a player, would go on to break many of Aparicio's defensive records. Although you can find a few cards issued by Post, Bazooka, and Leaf during Aparicio's playing days, Topps is the primary option. 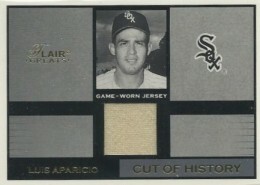 It would not be until after his retirement, during the 1990s and 2000s, that companies issued Aparicio cards in their Hall of Fame products. Certified Aparicio autographs first arrived in 2000 Fleer's Greats of the Game, and jersey and bat relics came in several 2001 sets put out by Upper Deck, including Gold Glove and Legends. A career as long and as storied as Aparichio's also offers a wide range of baseball cards to collect. The list below identifies ten key cards using value as a key component, but also including factors like card composition and variety to form a well-rounded guide. Starting things off, we have Aparicio's base card from one of the most beautiful sets ever made, 2007 Upper Deck Masterpieces. This set combined the fantastic art included on Donruss Diamond Kings and expanded it over an entire set using some great shots. While the base card can be found for a dollar or two, the wide variety of framed colored inserts in the set, including windsor green, black linen, and pinot red, offers an opportunity to build a valuable set of rainbow parallels. Pulling a plain-white jersey card for more current players may not be the most exciting hit, but finding a jersey card featuring a piece of an old woolen jersey from the 1950's or 60's is something amazing. Although Flair only produced cards for a few years in the late 1990s and early 2000s, their 2003 Flair Greats set is memorable for offering jersey cards for many Hall of Fame members and fan favorites, including a few variations of Aparicio's jersey relics. In 1958, Topps began including specific cards for players selected to the All-Star game. The 1958 set was done in cooperation with the publication Sport Magazine. This card honors Aparicio's first All-Star team selection, which would be one of ten yearly trips he would make over his career. 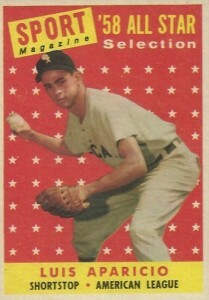 The 1959 Topps All-Star cards saw a change from the previous year's set as All-Star selections were attributed to The Sporting News rather than Sport Magazine. The cards are beautifully framed around a shield with an eagle siting on top. Major League Baseball also made changes to the All-Star game format by adding a second All-Star Game to the schedule. The first was played in July and the second was played in August. Aparicio started at second base for the American League in both games. Like many infielders, Luis Aparicio is forever tied with his other teammates positioned around the horn. 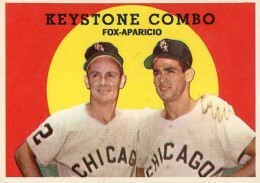 During his White Sox years, he was a part of the best double-play combo in baseball with Nellie Fox, and they even shared a "Keystone Combo" card in the 1959 set. 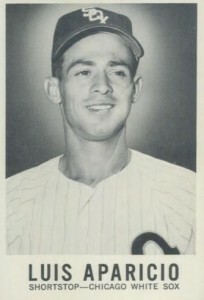 The were so closely associated that in the 1959 American League MVP voting, Aparicio finished in second place just behind Fox, who won the award. Luis Aparicio has many autographs in both mid-range and high-end contemporary products and they are easily found at prices below $30. Because of this, Aparicio is an ideal starting place to being if you are interested in beginning a Hall of Fame autograph collection. The 2003 Topps Retired Autograph cards came packed in a sealed plastic holder, so these cards are typically found in very good condition. Collectors interested in picking up a key Aparicio from early in his career should look for his second-year card. 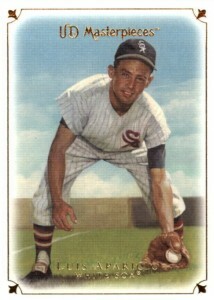 The 1957 set features full-color photographs without painted backgrounds for the first time and Aparicio's card showcases him about to snag a grounder. 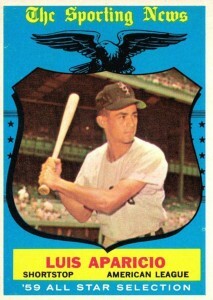 The return of Leaf brand to the trading card world in 1960 found Aparicio in the first card position. Because of this, the value of his card gets the "Andy Pafko Bump," which refers to the famous 1952 Topps card that was often inadvertently damaged by collectors. Mint versions of cards in the #1 position are often very difficult to find. There are even some Leaf prototype cards from this set with a slightly different design that command very high prices. 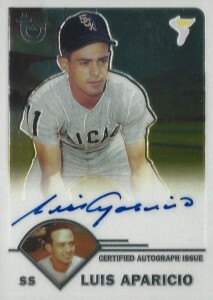 Luis Aparicio's rookie card from 1956 Topps is the perfect personification of him as a player. He seems to be jumping for joy in the background image, with an energy that would help him play more games at shortstop than any other player in history when he retired after 18 seasons. This is Aparicio's most valuable card. Great list! My favorite Aparicio card didn’t make it though – it is the 1999 Fleer Sports Illustrated card. There’s a base card version, and an autographed version, which is very affordable! 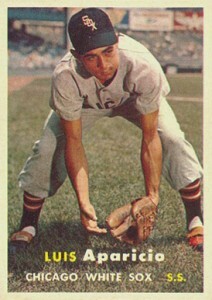 The card features a low angle shot of Luis sliding feet first into a base. It was a Sports Illustrated magazine cover.